Today is the shortest day of the year, and don’t we know it. Recently the days have been short enough as it is, but today we will have only 9 and a half hours of daylight. Sadly in the UK longer nights are a fact for what feels like the majority of the year, but garden lighting is one of the most effective ways of improving the functionality of your outdoor space, and it means you can spend more time appreciating it. Lighting can be used to add warmth to your garden in the winter months, cutting through the thick darkness outside your window, which quite frankly, can be a little disconcerting. Using coloured lights can further add to this warmth by creating either a softness or a contrast depending on the design you’re looking for. There are many different garden features that can be highlighted by lighting to really draw attention to your favourite design parts. You could place lighting along steps to turn them into the night time focal point of your garden. This is also important from a safety point of view. Alternatively you might decide you want to make the walls in your garden the focus and enhance their natural beauty and elevation. Or perhaps feeling safe is an important factor for you, and you simply want a bright light to fill your garden space that alerts you to any activity, or that comes on automatically when you’re out and about. Of course decision must also be made about the type of lighting you choose. Do you go for solar powered, bright but economical LED’s, or do cables need to be installed. This should be decided before any construction goes ahead to ensure the relevant fixings are buried and put in place. Also consider the angle at which you direct your lights. Uplighting a slim tree will make the silhouette really stand out, or pointing your lights downwards onto a seating area would create more of a ‘theatre’ space. This would also allow you to be active outside for many more hours after the daylight has faded, whether it’s just you or if you’re entertaining friends. 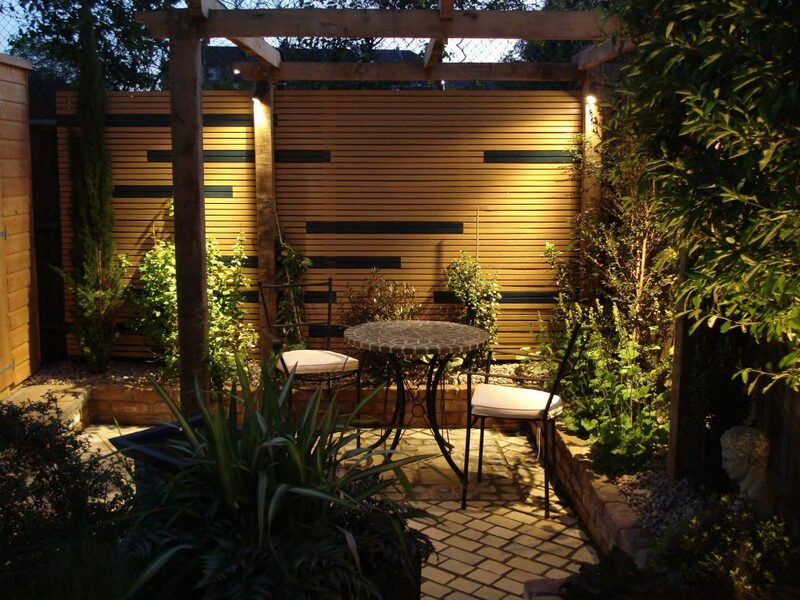 Whatever your choice, we’ve created many gardens that incorporate lighting, some of which can be seen in our Portfolio, and you’ll find, if used properly, your garden space can look completely different at night when compared to how it looks during the day. Almost like having two gardens in one. So don’t get caught in the dark, let there be light!